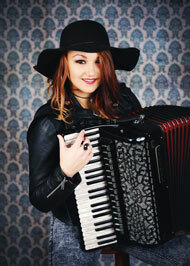 Veronika Todorova, 20 years-old bulgarian accordionplayer, practices since she was six. Trained by bulgarian, german und italian masters she won several national and international competitions since the late 90th. “Deutsche Meisterin 2006“ in Baden Baden, “Primo Assoluto“ in Lanciano, “best female accordionplayer 2006“ at the World Cup in Norway. The list of victories is endless. Soon the media focussed on her. Concerts at several german radio and television stations like SWR-3, Radio Berlin, Deutsche Welle and Hessischer Rundfunk followed. Newspapers and magazines wrote portraits and reviews about her concerts and her studies with jazzaccordeonstar Renzo Ruggieri from Italy. In december 2005 she meets drummer Axel Spreitzer and bassplayer Detlef Görke, and soon they started with the “Veronika Todorova Band“. The trio convinces with vitality, flexibility and an originally sound at many rejoycing concerts. Tango, jazz and balkanpolka are only three of numerous highly musical stiles presented excellently by the band. Since twentyfive years Detlef Görke is working as an experienced live- and studiobassplayer in several rock-, funk- and fusionbands. His lp- and cd-productions started in the late 80th. He toured with The Original Cast, Big Fun Unlimited, M.T. Wizzard and Bubinga all over europe. Axel Spreitzer plays the drums since thirty years. He was touring for many years with blues-, jazz-, rock- and metalbands like Aizz, Catfish Bluesclub and Tiger B. Smith in germany. Veronika and Detlef also founded the TangoRova-quintet playing the tango of Astor Piazolla. They are accompanied by Magdalena Todorowa on piano, Katharina Lorenzen on flute and Liv Wagner on violin.